Trappers Lake in Garfield County taken June 2003. Division of Wildlife. Loyse Hinkle, Colorado Parks and Wildlife. Colorado Partners in Amphibian and Reptile Conservation (COPARC) is calling for abstracts! 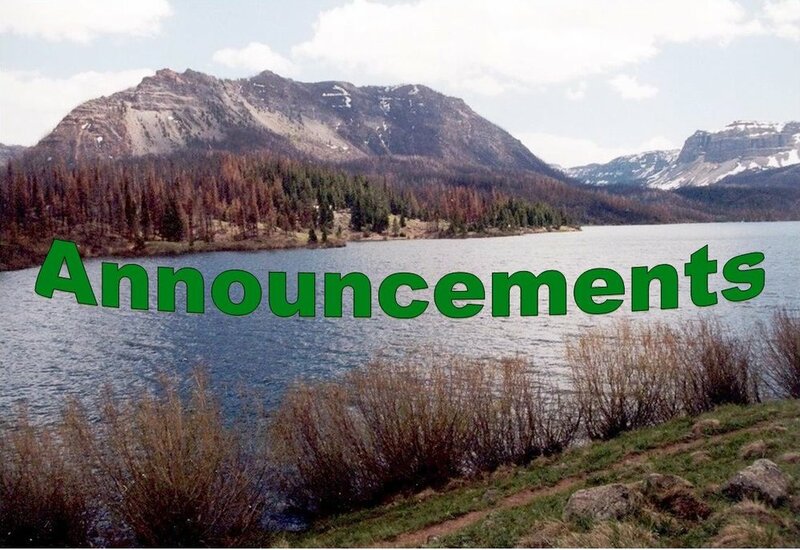 COPARC seeks oral and poster presenters at the annual meeting of Colorado Partners in Amphibian and Reptile Conservation to be held May 4th - 6th, 2018 at Lake Pueblo State Park. Presentations by students (undergraduate, graduate) are strongly encouraged. Oral presentations will be 15-20 minutes. A poster session and social will be held to facilitate the sharing of ideas and interactions among attendees and presenters. DEADLINE for submission of abstracts to be considered for oral presentations and poster abstract: Tuesday March 27, 2018. For details visit HERE. Call for Abstracts! The Watershed Summit is looking for a select number of individuals who are engaged in innovative projects throughout the water field and would be interested in sharing their work. These creative, compelling presentations will be interspersed throughout the agenda. Presentations will range from 5-20 minutes depending on capacity. Abstracts are due by April 1st and notifications will go out by the end of April. Actual event is June 28th, 2018 at the Denver Botanical Gardens. Save the date! Click HERE for pertinent details. The Boulder Reservoir Birds of Special Concern/Raptor Monitoring Program is RECRUITING volunteers.Training is scheduled from 9 a.m. to 1:30 p.m. on Saturday, April 14th, 2018. Responsibilities for this volunteer position include monitoring and reporting animal presence, bird behavior, nest locations, fledgling success and wildlife closure violations, and assisting with educating the public. The minimum volunteer commitment for this program is to monitor your chosen site at least once monthly April – July for a total of at least 4 times. The days are flexible. Each session will be about 1.5 hours. Monitoring is most effective at dawn or dusk. The all-day training for this program includes slideshow presentation will be held in the morning followed by an easy walk of the monitor locations. Monitors should be able to work independently and have their own binoculars. Skilled birders with the ability to identify osprey, American bittern, northern harrier and burrowing owl are preferred, but some identification training will be provided for beginners. The training will cover targeted birds and field protocols, visits to monitoring locations, signups for locations and field trainings, and meeting your fellow program participants. For more information and to sign up, please fill out the form HERE or contact Mary Malley, volunteer services coordinator, at 303-413-7245 or malleym@bouldercolorado.gov. Volunteer to help Clean up the Eleven Mile Canyon! Join us on Saturday April 21st at the pull out just before the toll booth so we might become organized and car pool into the canyon. Bring your fishing gear as we must wet a line at the end of our task. Please plan on bringing a lunch!!! Click HERE to register! The Society of Wetland Scientists’ 2018 Annual Meeting will be held at the Hilton Denver City Center in Denver, Colorado, May 29th-June 1st. This unique meeting is themed “Wetland Science: Integrating Research, Practice, and Policy – An Exchange of Expertise.” Reserve your spot to network and build professional connections with the highest level of wetland professionals at the 2018 Annual Meeting. Simply complete and return the Exhibitor Agreement to reserve your booth today! Agreements must be received by April 30, 2018. Click HERE for more information.